COLUMBUS — Voter advocates reassured voters on Tuesday that Ohio’s election system is secure and urged Ohioans to use the toll-free Election Protection Hotline if they encounter any voting-related issues. Recently, concerns about the potential for elections to be “rigged” has been raised in the context of the US Presidential campaign, and election officials of all political backgrounds – including Ohio Secretary of State Jon Husted – have strenuously defended the integrity of our election system. “Voters should be reassured that Ohio has bipartisan election administration,’’ said Catherine Turcer with Common Cause Ohio. “Like Noah’s ark, poll workers go two by two; one Democrat and one Republican. There are built in safeguards like voter identification and signature match. The voter verified paper audit trail on touch screen voting machines provides protection as well. The name of the candidates rotate position with each precinct and there is an audit following the election.”. Still, the intensity of this year’s election has left many voters with questions, said election law expert Camille Wimbish, of Ohio Voter Rights Coalition who provides answers through the Election Protection Hotline. Voters are not expected to encounter problems whether voting early or on Election Day, but those who do are urged to call the Election Protection at 866-OUR-VOTE. Volunteers will be available to assist with any voting-related questions or problems that arise during Ohio’s early voting period, which started Oct. 12 and runs through Nov. 7. The hotline will also be operating during Election Day on Nov. 8. Ohio voting advocates joined forces with the national, nonpartisan Election Protection coalition to provide live assistance for Ohio voters throughout the four-week early voting period that started on October 12. Voters can call 866-OUR-VOTE (866-687-8683) toll-free from 7 a.m. to 10 p.m. EDT on Election Day. Spanish-speaking voters may seek bilingual assistance through the 888-VE-Y-VOTA (888-839-8682) 6:30 a.m. EDT to 10:30 p.m. EDT. Assistance is also available in a variety of Asian languages through the 1-888-API-VOTE (888-274-8683). Frequent questions from voters range from the location of the early in-person voting sites across the state to inquiries about when they will receive absentee ballots in the mail. While the Election Protection hotline is national, calls from within Ohio during Early Vote will be routed directly to volunteers based in Columbus. Election Protection, the nation’s largest nonpartisan voter protection coalition, led by the Lawyers’ Committee for Civil Rights Under Law, is working in partnership with Ohio groups such as Common Cause Ohio, League of Women Voters of Ohio, the Ohio Unity Coalition, Ohio Voice and the Coalition on Homelessness and Housing in Ohio to staff a hotline to answer questions about the state’s early voting process. Ohio Election Protection will post periodic updates on questions or issues identified by OhioVoters in Twitter. Look for our logo or go to #VoteEarlyOH. 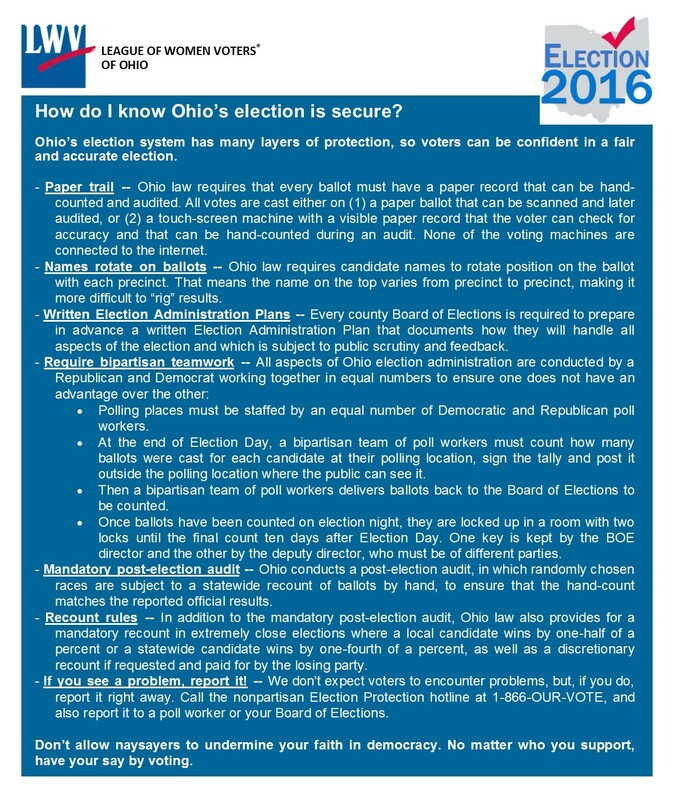 A list of questions and answer can also be found on the League of Women Voters’ How do I know Ohio’s election is secure?